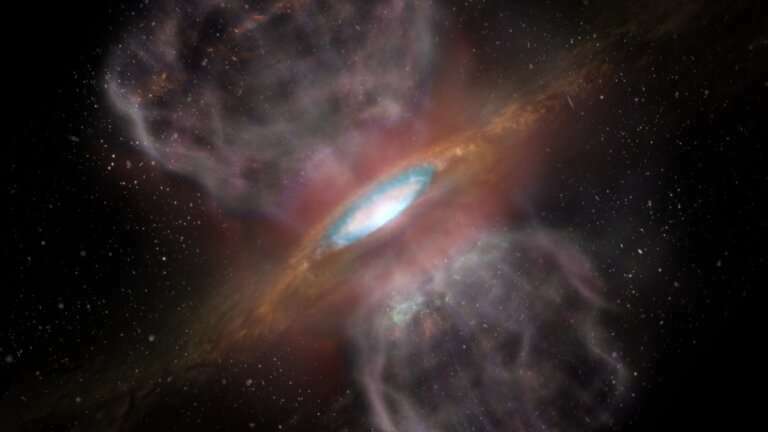 "It's amazing we're seeing these molecules at all," said Adam Ginsburg, a Jansky Fellow of the National Radio Astronomy Observatory (NRAO) in Socorro, New Mexico, and lead author of a paper accepted for publication in the Astrophysical Journal. 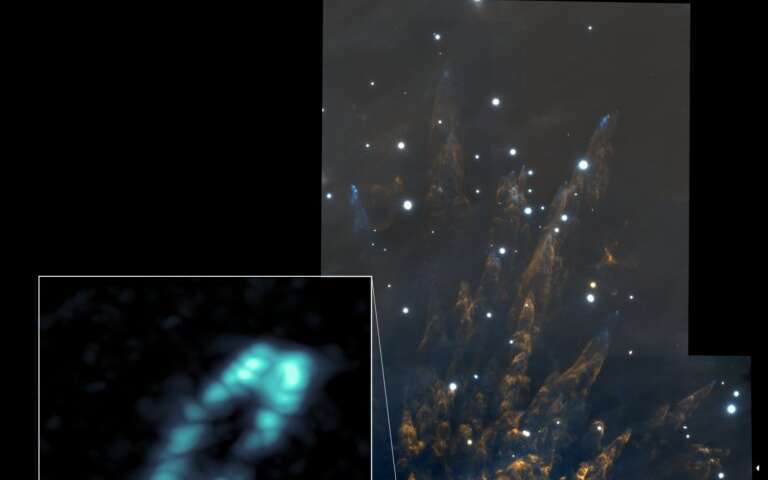 "Since we've only ever seen these compounds in the sloughed-off outer layers of dying stars, we don't fully know what our new discovery means. The nature of the detection, however, shows that the environment around this star is very unusual." To detect molecules in space, astronomers use radio telescopes to search for their chemical signatures—telltale spikes in the spread-out spectra of radio and millimeter-wavelength light. Atoms and molecules emit these signals in several ways, depending on the temperature of their environments. The new ALMA observations contain a bristling array of spectral signatures—or transitions, as astronomers refer to them—of the same molecules. To create such strong and varied molecular fingerprints, the temperature differences where the molecules reside must be extreme, ranging anywhere from 100 kelvin to 4,000 kelvin (about -175 Celsius to 3700 Celsius). An in-depth study of these spectral spikes could provide insights about how the star is heating the disk, which would also be a useful measure of the luminosity of the star. "When we look at the information ALMA has provided, we see about 60 different transitions—or unique fingerprints—of molecules like sodium chloride and potassium chloride coming from the disk. That is both shocking and exciting," said Brett McGuire, a chemist at the NRAO in Charlottesville, Virginia, and co-author on the paper. "Usually when we study protostars in this manner, the signals from the disk and the outflow from the star get muddled, making it difficult to distinguish one from the other," said Ginsburg. "Since we can now isolate just the disk, we can learn how it is moving and how much mass it contains. It also may tell us new things about the star." The detection of salts around a young star is also of interest to astronomers and astrochemists because some of constituent atoms of salts are metals—sodium and potassium. This suggests there may be other metal-containing molecules in this environment. If so, it may be possible to use similar observations to measure the amount of metals in star-forming regions. "This type of study is not available to us at all presently. Free-floating metallic compounds are generally invisible to radio astronomy," noted McGuire. The salty signatures were found about 30 to 60 astronomical units (AU, or the average distance between the Earth and the Sun) from the host stars. Based on their observations, the astronomers infer that there may be as much as one sextillion (a one with 21 zeros after it) kilograms of salt in this region, which is roughly equivalent to the entire mass of Earth's oceans. "Our next step in this research is to look for salts and metallic molecules in other regions. This will help us understand if these chemical fingerprints are a powerful tool to study a wide range of protoplanetary disks, or if this detection is unique to this source," said Ginsburg. "In looking to the future, the planned Next Generation VLA would have the right mix of sensitivity and wavelength coverage to study these molecules and perhaps use them as tracers for planet-forming disks." Orion Source I formed in the Orion Molecular Cloud I, a region of explosive starbirth previously observed with ALMA. [And here.] 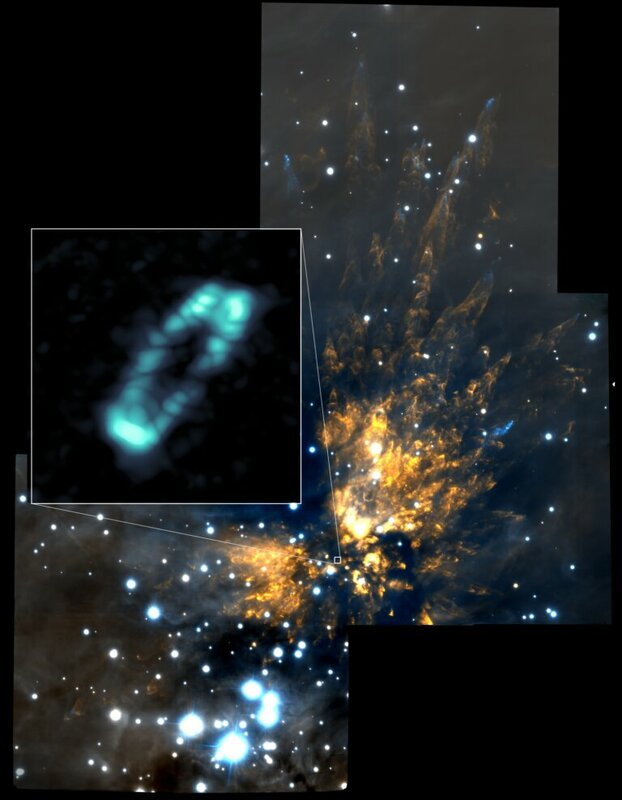 "This star was ejected from its parent cloud with a speed of about 10 kilometers per second around 550 years ago," said John Bally, an astronomer at the University of Colorado and co-author on the paper. "It is possible that solid grains of salt were vaporized by shock waves as the star and its disk were abruptly accelerated by a close encounter or collision with another star. It remains to be seen if salt vapor is present in all disks surrounding massive protostars, or if such vapor traces violent events like the one we observed with ALMA."